Canada faces the threat of violence by a small number of individuals who have become radicalized for political, religious or other ideological reasons. The Government of Canada is concerned with all forms of violent extremism, not associating this phenomenon with any particular religious, political, national, ethnic, or cultural group. While Canada has faced a variety of threats stemming from violent extremism in recent decades, the main terrorist threat to Canada continues to be violent extremists inspired by terrorist groups such as Daesh and al-Qaeda. However, individuals espousing and engaging in violence can be inspired by any extremist group promoting such behaviour. For example, some individuals within the far-right movement have espoused, glorified, promoted, and even engaged in violence. As well, historically, some far-left extremists have taken part in violent acts such as pipeline bombings. The Government of Canada is also alerted to the dangers of lesser-known forms of violent extremism. In its ongoing efforts to keep Canadians safe, the Government of Canada is expanding how it responds to violent extremism. Specifically, the federal government is investing in the prevention of radicalization to violence as articulated through the National Strategy on Countering Radicalization to Violence. Prevention aims to thwart violent radicalization from happening in the first place and to intervene as early as possible when it is occurring. Preventing and countering violent extremism is an effective complement to security agencies' traditional methods of safeguarding national security. The Government of Canada is focused on preventing radicalization to violence and also recognizes the increasing concern about expressions of intolerance and hate in the public and online spheres. While implementing the National Strategy, the Government of Canada will be examining how to increase individual and group resilience to extreme expressions of intolerance and hate, and how to prevent expressions of hate and intolerance from escalating into incidents of violence. The National Strategy is articulating the Government of Canada's approach to countering radicalization to violence and is a means to discuss this subject with key partners and Canadians. The landscape of the threat is constantly changing, as are local and global realities. Therefore, the Government of Canada will aim to keep the National Strategy adaptable and responsive in an effort to increase our collective strength in preventing radicalization to violence and the harms it can cause. The National Strategy on Countering Radicalization to Violence engages with a variety of actors from police to community organizations to identify and prevent radicalization to violence before tragedies occur. There is substantial knowledge, experience, expertise, and evidence at the local, national, and international levels to rely on in developing approaches to countering radicalization to violence. 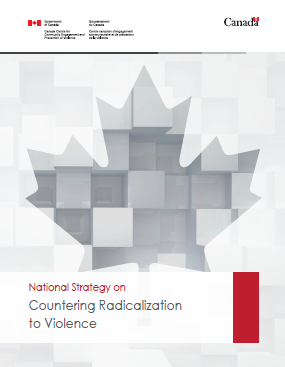 In this context, the National Strategy on Countering Radicalization to Violence identifies areas where expertise and capability exist, and how the Government of Canada and its partners are investing to enhance our collective strengths. To explain radicalization to violence and the destructive and harmful behaviours involved, including their impacts on Canadians and communities. To outline the Government of Canada's approach to preventing and countering radicalization to violence through early prevention, at-risk prevention and disengagement from violent ideologies. Building, sharing and using knowledge. Addressing radicalization to violence in the online space. Countering radicalization to violence is a key priority of the Government of Canada. In 2015, the Prime Minister mandated the Minister of Public Safety Canada to develop the Canada Centre. The 2016 Budget allocated $35 million over five years and $10 million per year on-going to establish the centre and support its work. Community Resilience Fund: The Canada Centre administers the Community Resilience Fund to support research and programs to build the evidence base along with local capability and capacity to counter radicalization to violence in Canada. For 2019‑2020 and beyond, the fund will have $7 million available each year for existing and new projects. For more information about the Community Resilience Fund, visit the Public Safety Canada website at publicsafety.gc.ca. Policy guidance including the development of the National Strategy on Countering Radicalization to Violence. Promoting coordination and collaboration with a range of actors to respond to local level realities and prevent radicalization to violence. These partnerships include all levels of government, communities, community organizations, front-line workers and practitioners, academics, and police. Funding, planning and coordinating research to better understand radicalization to violence and how best to counter it. Also, mobilizing evidence to reach front-line workers and practitioners who are working to prevent radicalization to violence. Targeted programming through the Canada Centre's Community Resilience Fund to provide financial support to initiatives that aim to prevent radicalization to violence in Canada. Given the international dimension of the threat from violent extremism, the Canada Centre works in close collaboration with partners in the Five Eyes (United States, United Kingdom, Australia, New Zealand), the Group of Seven (G7) and the European Union. The Canada Centre also actively engages in multilateral forums such as the United Nations and the Global Counterterrorism Forum (GCTF), which strengthen and coordinate international efforts and build civilian capacity to combat terrorism, including efforts to prevent and counter violent extremism. The Government of Canada also engages in the Global Coalition against Daesh, which is a partnership of 79 countries that are united in efforts to defeat Daesh through multiple fronts, including preventing the flow of foreign terrorist fighters across borders and countering the group's communications. Radicalization is a process by which an individual or a group gradually adopts extreme positions or ideologies that are opposed to the status quo and challenge mainstream ideas. Radicalization to violence is the process by which individuals and groups adopt an ideology and/or belief system that justifies the use of violence in order to advance their cause. Violent extremism is a term describing the beliefs and actions of people who support or use violence to achieve extreme ideological, religious or political goals. It is important to recognize that radicalization, or having radical thoughts, is not illegal or necessarily problematic in and of itself. The Canadian Constitution, through the Charter of Rights and Freedoms, protects Canadians' freedom of thought, belief, opinion and expression. Radicalization to violence occurs when a person or group takes on extreme ideas and begins to think they should use violence to support or advance their ideas or beliefs. These beliefs can fall along a wide spectrum of ideologies, including political and religious ideologies. Funding violent extremist or terrorist groups. Spreading messages and narratives that incite violence and hatred. Recruiting individuals to become part of a violent extremist or terrorist group. Travelling to join violent extremists or terrorist groups abroad. Expressing support for a terrorist group. Radicalization to violence is not a phenomenon that uniquely affects individuals of any particular background, culture or religion. The socio-economic circumstances, levels of education, experiences of marginalization, and religious affiliations of individuals who have radicalized to violence in Canada are extremely diverse. Nonetheless, a number of factors can influence an individual's path to radicalization to violence. These can be specific to the individual or can be based in their immediate surroundings, or in society at large. In all cases, however, the justification for the use of violence is tied to some form of extremist ideology or belief system. Gender Dynamics: Research suggests that men and women share many of the same factors that draw them to join violent extremist groups, such as a desire for adventure, empowerment, belonging, purpose, and to assert a particular identity that they view as being marginalized. However, these factors can be experienced differently by men and women. Violent extremist and terrorist organizations deliberately exploit gender norms and dynamics to recruit and maintain membership. Understanding this dynamic is vital to designing and delivering effective measures to counter these efforts. Social networks: Close friends and family can influence an individual's interest in an extremist ideology that calls for violence. Online communities can exert a similar influence. Grievances: Some individuals become so preoccupied with a social injustice —real or perceived—that they join an extremist group that promises to challenge it through violence. These grievances can range from feeling personally discriminated against to perceived injustices occurring abroad. Sense of belonging: Similar to joining criminal gangs, joining violent extremist groups or causes can make individuals feel like they are part of a group. Inclination towards violence: Some individuals are simply attracted to violence, while others are drawn to the perceived heroic roles promised to those who join violent extremist or terrorist groups. Positive influences of credible friends, family members or mentors. Belief systems that reject violence as a solution to problems. Other sources of purpose and social belonging, such as employment, school, sports or cultural activities. Trusted avenues for concerned friends, family, front-line practitioners and community members to seek help in understanding and addressing worrisome signs. Professionals who are trained to assess risks and provide tailored interventions. Radicalization to Violence of a High School Student - Scenario A: Alex, a high school student gets into an argument about Canada's foreign aid with another student who happens to be a recent immigrant. Alex is outraged that Canada provides help to foreigners when so many Canadians are in need. This incident makes him believe that immigrants should not have a say about any of Canada's policies. Noticing his outrage, a friend takes Alex to a protest organized by a far right group that proclaims anti-immigrant rhetoric. After the protest, the organizers invite him to hang out, and he becomes interested in learning more about their group. He starts to follow those individuals on social media, where they post about their ideas and upcoming protests. After attending a few more protests, Alex begins to help the group organize their rallies and gather support for their cause on social media, leading the group's leadership to give him an important position in the group. As a full member of this group, he starts vandalizing immigrants' places of worship and taking part in violence by attacking visible minorities on the streets. Alex quickly becomes known to the police, who are collecting evidence in order to arrest and charge him with criminal offences. Group dynamics play important roles in shaping individual involvement and action in violent extremism. Even for individuals who seemingly operate alone, their actions are often shaped through their relationships with groups and social networks, both in-person and online. Intra-group influences: Groups can exert important influences on its members. For example, research has shown that people in a group setting often feel pressure to conform and maintain group cohesiveness, making them reluctant to disagree with others in the group. People also tend to believe that unanimity exists among group members, regardless if that is actually true. Moreover, group discussions can lead individuals to become more entrenched in their pre-existing views, and increase their openness to make riskier decisions. Competition within groups and networks: Sometimes groups will compete against each other, even though they espouse the same ideology, to demonstrate credibility or superiority by engaging in violence. Alternatively, individuals can splinter off from a group because the group is unwilling to use violence, therefore leaving a splinter group united by their willingness to use violence. Isolation and separation: Research has shown that fellow group members are considered more persuasive, while outsiders tend to be viewed as having a hidden agenda. This can sometimes lead groups—especially groups that experience opposition from mainstream society—to isolate themselves, where they increasingly rely on their own members for information, confirmation, and justification. Ignoring outside voices, extremist groups can drift further into extremism and ultimately into violence. History and past experience: Groups or social networks can become inspired by the past in their search for ways to address current grievances. This is why ideologically-driven violence is frequently linked with specific places and individuals or groups that have experienced past violence or collective trauma. Perceiving a threat: Groups sometimes resort to violence when members believe they are under threat. The threat can be specific, such as when groups feel attacked by mainstream society, the government, the media, or the police. The threat can also be more diffuse, such as when groups feel they are losing their values and traditions, or during periods of economic hardship and high unemployment, or at times of large political and social change. Individuals and organizations who actively counter violent influences. Societal and community-based practices and narratives that discredit violence and value other forms of social and political engagement. Strong relationships within and among communities that support positive norms and narratives. Trust in relevant state and social institutions, such as the education system, health and social services, the criminal justice system, security and intelligence institutions, the media, and mainstream society as a whole. Individuals trained in effective interventions to interrupt or calm escalation. Physical, emotional and psychological impact: The most obvious harm is the direct victimization of those who experience and witness attacks. Violent extremism can also create fear and increase people's sense of insecurity of society as a whole. Normalization of violent action and rhetoric: There is evidence that exposure to some forms of extremist and terrorist violence can lead to its perpetuation. Polarization: A significant concern is that the destructive actions of some individuals or groups will prompt stereotypes and 'reciprocal' radicalization to violence by opposing individuals or groups. This dynamic can potentially worsen larger-scale divisions and grievances. Reduction of trust: Some studies on the impact of terrorism find that terrorist attacks are associated with lower levels of trust in fellow citizens, national institutions and the legal system. Effective, appropriate support for victims of attacks in the short, medium and long term. Meaningful, non-violent avenues to address grievances and conflicts and to advocate for social change. Positive social values, including mutual respect and sense of belonging for all. Ways to de-escalate, counter and marginalize destructive discourses in the media and public sphere. Well-functioning state, social institutions and media platforms and outlets that are viewed as procedurally fair. Working Together to Prevent Radicalization to Violence: The Government of Canada and its partners are making connections across diverse domains to better prevent radicalization to violence in Canada. These include multiple levels of government and a range of societal actors in Canada. For example, there are many existing efforts to address factors that can push an individual on a pathway to radicalization to violence such as engaging in or experiencing hate speech, community based conflicts and mental health issues. At the same time, within the Government of Canada, and within provincial and territorial governments, many departments, such as Immigration, Refugees and Citizenship Canada, deliver social programming that contributes to building resilient communities and individuals and fostering social cohesion which indirectly supports the approach to preventing radicalization to violence. As a centre of excellence, the Canada Centre is developing expertise in understanding radicalization to violence in the Canadian context and the most effective ways to counter it. This includes listening and learning from communities, key federal, provincial and territorial partners, police and domestic and international experts. Based on what is known about best practices in countering radicalization to violence, the Canada Centre is prioritizing efforts that fall within three broad categories: early prevention, at-risk prevention and disengagement from violent ideologies. Raising awareness about radicalization to violence so individuals can distinguish it from holding extreme views and identify when someone is at risk of engaging in violence. Increasing critical thinking skills and digital literacy so people are less vulnerable to manipulation and influence of terrorist and violent extremist messaging online. Supporting narratives that challenge violent extremism and promote positive social engagement. Supporting outlets for respectful and meaningful dialogue and social action that allow grievances to be addressed in non-violent ways. Supporting in the development of curricula and training for teachers that encourage open dialogue on complex issues in classrooms and provide students with prosocial avenues to discuss their grievances. Interventions with individuals showing signs of vulnerability or risk in order to build protective factors and divert them from the path towards violent extremism. Appropriate tools for family members, peers, and front-line workers and practitioners, such as police officers and mental health professionals, to intervene with those at risk. Tools and strategies to engage individuals who are interacting with harmful content online that may be radicalizing them towards violence. Disengagement efforts are aimed at individuals who have become directly involved in ideologically-motivated violence. These include individuals on peace bonds, incarcerated for terrorism offences, or returning from conflict zones. Disengagement programs serve as a complement to the comprehensive work of Canada's security and policing agencies in monitoring, investigating, and building a case for criminal prosecution. These programs, such as initiatives to help individuals exit from violent extremist groups, are another way of mitigating the potential threat posed by these individuals. Whole-of-Government-Approach: The Canada Centre recognizes the contributions of other federal government departments and is working closely with them to ensure that efforts to counter radicalization to violence complement each other strategically. For example, the Royal Canadian Mounted Police supports community engagement and training for first responders which aims to provide greater national security awareness. Internationally, through the Counter Terrorism Capacity Building Program (CTCBP), Global Affairs Canada supports local and regional programming aimed at countering violent extremism. As well, the Department of National Defence helps to enable a secure environment which allows other non-military efforts to break the lifecycle of recruitment and radicalization to violence. For more information on other relevant horizontal initiatives, see the Annex. Countering radicalization to violence is a relatively new undertaking for the Government of Canada. Across the country, much work is needed to build resilience against violent extremism, as well as to build capacity to intervene with individuals who are at risk of—or who already are—radicalizing to violence. Each priority features activities and investments that align with the Government of Canada's approach to countering radicalization through early prevention, at-risk prevention and disengagement from violent ideologies. Programming investments are focused in areas where evidence exists and best practices have been developed. In other areas, research and evaluation is planned or underway to build knowledge and measure success to determine how the Government of Canada can most effectively counter radicalization to violence. The Government of Canada does not establish priorities in isolation. The Canada Centre consistently engages with stakeholders to guide the on-going development of priorities to support Canada's work to counter radicalization to violence such as local community partners, front-line workers and practitioners, representatives from multiple governments, as well as research networks such as the Canadian Network for Research on Terrorism, Security and Society. The Government of Canada also actively engages internationally to access the best available knowledge and practices to inform our approach to countering radicalization to violence. The Canada Centre leverages and contributes to global expertise through forums like the United Nations and the Global Counter-Terrorism Forum, and through initiatives such as the Institute for Strategic Dialogue, the Hedayah Center, and the Centre for Research and Evidence on Security Threats (CREST). Build knowledge on reliable and meaningful indicators of radicalization to violence and protective factors. Build knowledge on methods to measure and evaluate the effectiveness of programs aimed at countering radicalization to violence. Share knowledge by connecting researchers and practitioners across Canada to share best practices through conferences and events. Supporting Research: Through the Community Resilience Fund, the Canada Centre is leading, supporting and planning a number of key research projects on topics such as understanding pathways to radicalization to violence for Canadians who have travelled abroad to join terrorist organizations, and the landscape of far-right extremist groups in Canada and the potential for groups to adopt violence. As well, through the fund, the Canada Centre is supporting projects to understand how hate crime interacts with radicalization to violence, as well as how they can be prevented and countered. Supporting the CPRLV: Through the Community Resilience Fund, the Canada Centre is supporting the Centre for the Prevention of Radicalization Leading to Violence, located in Montréal, to conduct research on better understanding risk and protective factors within families of individuals who radicalize to violence and also the role families and communities can play in mitigating radicalization to violence. Understanding and considering these risk factors and the role of families can help ensure that prevention strategies are effective. The project also aims to improve support and care strategies for families affected by radicalization to violence. Knowledge Informs Decision Making: Some decisions to manage radicalization to violence can have unintended consequences. For example, a school may decide to expel a youth from school because he is deemed as espousing violent extremist views. While this may give the impression of protecting other students from being exposed to violent extremism, separating the youth from important protective factors provided by the school setting may actually increase the youth's risk of further radicalizing to violence. That is why evaluating and measuring the effectiveness of interventions are key requirements for programs that aim to counter radicalization to violence in Canada. Countering radicalization to violence is a relatively young field compared to other areas of prevention. Therefore, building a knowledge base is a key priority for the Government of Canada to ensure that evidence is used to guide policies and the creation and implementation of programs to prevent and counter radicalization to violence in Canada. While evidence is crucial to inform best practices, it is also crucial to avoid the possible unintended consequences—and even harms—of efforts aimed at countering radicalization to violence. Knowledge, based on research, monitoring, measurement and evaluation, is a safeguard that can help prevent the potential harmful consequences of even the best-intentioned programs. In its efforts to build a knowledge base, the Canada Centre is concentrating on several key research topics which include, for example, better understanding meaningful indicators of radicalization to violence. There is an important need to recognize when individuals or groups are escalating in behaviour and motivation in ways that are becoming dangerous and destructive. Many researchers are working to identify the warning signs of these shifts towards violence, but detecting these indicators has proven challenging. Some indicators, such as the increasing use of dehumanizing language, or the persistent viewing of violent videos online, often occur when someone is radicalizing to violence. Yet some individuals who will never radicalize may engage in these behaviours; and incorrectly identifying them as such can lead to grave, unintended consequences. On the one hand, failure to identify an individual radicalizing to violence is a missed opportunity to intervene. On the other hand, mistakenly identifying an individual as radicalizing can harm their reputation, and risks stigmatizing friends, relatives, and entire communities. The Canada Centre is investing in research to determine which indicators of radicalization to violence are reliable. The Canada Centre is also focusing its knowledge building efforts on the measurement and evaluation of programs. The practices of measuring and evaluating the effectiveness of initiatives to counter radicalization to violence are not as developed as in other fields. The Government of Canada is prioritizing efforts to embed evaluation into the design and delivery of programs to build the evidence base of what works—and what does not work—to prevent and counter radicalization to violence. For the knowledge base to be useful, best practices in countering radicalization to violence must be shared with the right people in the right way. Especially for early prevention and building resilience, knowledge must reach many different audiences: front-line workers, such as health and social service providers, teachers and other professionals in the education system, faith leaders, as well as parents, friends and community members who may be dealing directly with an individual radicalizing to violence. The knowledge must be useful and resonate with their perspectives. Some initiatives to counter radicalization to violence call for engaging specific populations like youth, or emphasizing the importance of families—or women in particular—as crucial for prevention. Yet these populations are often very diverse, whereby segments of these populations have very different social, political, and ideological views from each other. Without research to better understand relevant audiences, efforts to share knowledge can be ineffective or worse, lead to unintended negative consequences such as increasing their sense of distrust, alienation, or reinforcing stereotypes about groups being linked to violent extremism. Therefore, the Government of Canada will ensure that academic research and results are available and tailored to the various people across Canada who need it. To do this, the Canada Centre will connect researchers and practitioners across Canada to share best practices through conferences and events. The Canada Centre will continue to make research available by sponsoring academic experts on radicalization to violence to participate in public events and media appearances to answer questions and raise awareness of this issue. The Canada Centre will also produce research summaries, policy papers and info-graphics for practitioners, civil society and community leaders, and the general public. Support civil society in the development of digital literacy guidelines and alternative narratives. Work with technology companies and international partners to continue efforts to reduce the impact of terrorist and violent extremist content online. Support research to better understand how terrorists and violent extremist groups operate in the online space and how to counter their activities. Aaron Driver: Aaron Driver maintained a significant online presence, tweeting support for Daesh and engaging with Daesh supporters online. On the day of his death, Driver released a martyrdom video online, claiming allegiance to Daesh and stating his intent to carry out an attack. Subsequently, after an exchange with the RCMP during which Driver detonated an explosive device and did not comply with RCMP officers' directives, lethal force was used. Alexandre Bissonnette: Alexandre Bissonnette carried out an attack at a mosque in St. Foy, Quebec, killing six men. Previously, Bisonnette consumed far-right content online. Violent extremist and terrorist organizations use the internet and social media in various ways to further their cause. These include indoctrinating individuals into their ideologies and recruiting members to join their organizations or provide financial support. The online space is also used to inspire, incite, coordinate, finance and plan acts of violence. For example, al-Qaeda and Daesh provide material online in the form of magazines and videos with instructions on how to carry out acts of violence, such as guidance on the use of small arms, vehicles, and bladed weapons, and suggestions on how to inflict the most harm. Social media has allowed violent extremists and terrorists to target specific subsets of the population with tailored materials and messaging in attempt to recruit, incite and create social divides. For example, Daesh recruiters—both formal organization members and volunteers—work to groom their targets, isolating them from positive social influences and encouraging them to carry out real world action. Once trust is developed, often communication will move over to more secure platforms. Individuals who hold far-right violent extremist views are also very active online. Through chat forums and online networks, these individuals participate in a community that extends beyond borders. Individuals and groups with far-right violent extremist views use the online space to legitimize and normalize their views and narratives. They exploit public concerns in a way that will create a culture of fear, hatred, and mistrust, and to espouse and promote the use of violence. In the digital age, Canadians' online identities and activities blend into our offline lives. While the internet and social media do not cause radicalization to violence on their own, online activities can facilitate the radicalization to violence process or be used by those who have already radicalized to violence to further their cause, obtain recruits and circulate information on how to commit attacks. A commitment to the protection of human rights and fundamental freedoms, including Charter-protected freedom of expression and privacy rights. A commitment to diversity, as well as social and political inclusion for Canadians of all ages, gender identities, races, faiths, official languages, and levels of accessibility. Also, to provide safe spaces for Canadians so they can fully participle in the online space. These commitments are complementary and important supporting factors in efforts to reach sustainable, long-term success in addressing these issues. Preventing and countering radicalization to violence online is complex and requires a multi-stakeholder approach that includes national and international engagement with technology companies, academic researchers and civil society. Digital literacy: Guidelines can help Canadians of all ages develop critical thinking skills and build resilience to violent extremist and terrorist content online. Young people in particular can learn how to interact respectfully with others in the online space; to understand contexts of content they see; and to create, engage with and share online content in a responsible, safe and secure way. Alternative narratives: The best efforts to challenge violent extremist and terrorist narratives include alternative points of view developed and delivered by trusted and credible sources. These alternative narratives may relate to topics such as participation in democratic processes; the value and importance of inclusion and diversity; critical consumption of media; or positive roles played by all Canadians. Effective engagement with youth is critical to challenging violent extremist and terrorist use of the internet and social media. Young Canadians understand the online environment and how their peers use new and emerging social media platforms. Young Canadians are involved and engaged; they drive and sustain political and social action, and can develop and transmit effective alternative narratives that point to the errors, myths and contradictions in violent extremist and terrorist messaging. Also, they provide prosocial influences for their peers and can steer their energy toward positive political and social endeavours. The Canada Centre prioritizes work with Canadian youth, funds projects to provide a better understanding of the risks faced by youth in the online space, and facilitates engagement between youth and key partners, such as technology companies, researchers and academics. This engagement is meant to provide youth with the resources and capacity to develop and implement evidence-based online prevention initiatives such as alternative narratives and positive messaging. Working Together to Counter Violent Extremism: The Global Internet Forum to Counter Terrorism (GIFCT), established in 2017 by Google, Facebook, Twitter and Microsoft, is a mechanism for technology companies to work together to counter violent extremist and terrorist use of the internet. GIFCT fosters collaboration with smaller technology companies, civil society groups, academics, and multilateral bodies such as the European Union and the United Nations. The EU Internet Forum: The European Union addresses violent extremist and terrorist use of the internet through the EU Internet Forum. To reduce the accessibility of online terrorist content, the EU Internet Forum has created indicators for content removal. These indicators can be used to guide the activities of technology companies and to track where measures to counter violent extremist and terrorist activity in the online space are effective. It is critical for governments to cooperate with technology companies to effectively address violent extremists and terrorist use of the internet. Technology companies control the use of their platforms, have influence over their users and the content they host, and own data critical to understanding how to counter violent extremists and terrorist use of the internet. The Canada Centre leads the Government of Canada's engagement and cooperation with GIFCT alongside other G7 countries and Five Eyes partners. In recent years the technology companies making up GIFCT have taken a number of initiatives to disrupt terrorists' ability to operate on their platforms. Developing, repurposing and leveraging technology and automated solutions for the detection and removal of violent extremist and terrorist content that incites violence and hatred. Accurately identifying and removing violent extremist and terrorist content from online platforms within one hour of upload while ensuring respect for human rights and fundamental freedoms. Providing more comprehensive support to small companies with less technological capability, expertise, staffing and monetary resources to adequately address these issues. Adopting performance metrics consistent with those used by the EU Internet Forum to demonstrate progress against violent extremist and terrorist content. The Canada Centre will continue to work with technology companies and Five Eye partners to understand how online radicalization to violence can be prevented. Other domains where online activities result in harm, such as foreign interference in democratic processes and online child sexual exploitation, will also be examined to help inform approaches to addressing online radicalization to violence. Better understand the online ecosystem used by violent extremist and terrorist groups to inform prevention and mitigation strategies. Better support population groups most vulnerable to harms from radicalization to violence and hateful content, including youth, women and LGBTQ2S. Empower practitioners and youth to better leverage the online space to counter violent extremists and terrorist activities. A priority for the Canada Centre is to ensure that data for research and intervention programming is used only for the intended research project and is handled appropriately (e.g. is anonymized and free of personally identifiable information). Support training for front-line workers and practitioners so they can assess and intervene with cases of radicalization to violence. Continue to provide funding for local, comprehensive approaches to interventions. Support capacity building among multi-agency programs to intervene with cases of radicalization to violence. Radicalization to Violence of a High School Student - Scenario B: In Scenario A, Alex became involved with an anti-immigrant group and began to violently attack visible minorities on the streets. To steer Alex off the pathway of violent radicalization, interventions could have been made at multiple points. If a teacher or a school counsellor had facilitated an honest and informed discussion about immigration in class that might have helped him to distinguish the argument in which he was involved from the larger context of immigration. Another point where an intervention could have helped was when his friends and family saw him becoming involved with a group known to take part in vandalism and violence against minorities. At that point, they could have connected him with a practitioner, such as a social worker, who could have helped him disengage from the group, address vulnerabilities contributing to his radicalization to violence, and guide him to constructive avenues for personal development or political participation. Given Canada's regional diversity and the complexity of pathways towards radicalization to violence, there is no “one size fits all” approach for effective interventions. Intervention efforts must differ based on individuals' circumstances and local contexts, how advanced they are in their pathways to radicalization to violence, and the types of violent extremist groups or causes they are looking to join. Thus, interventions can take different forms, including mentoring and coaching, social support for employment and housing, psychological and trauma counselling, and participation in local community programs. The Government of Canada favours a local, comprehensive approach to interventions with individuals in the initial stages of radicalization to violence or requiring disengagement from violent ideologies. Through the Community Resilience Fund, the Canada Centre will continue to provide funding for flexible efforts designed to fit with individuals' local circumstances. Multi-agency Intervention Programs: Multi-agency intervention programs bring together a multitude of sectors including police, health and social services and education, to assess an individual's needs and determine the form of intervention required. In Canada, multi-agency intervention programs have been used in crime prevention. Internationally and in Canada, multi-agency intervention programs are now being recognized as good practices for countering radicalization to violence for individuals who show potential for imminent harm to self or others. This is due to their ability to quickly mobilize actors and organizations across society to develop interventions that are tailored to individuals and local contexts. Multi-agency programs are being used because many of the sectors represented in the partnership are equipped to help address some of the vulnerabilities that push and pull individuals towards violent extremism. By addressing a given individual's range of needs, vulnerabilities and risks, multi-agency programs can potentially redirect them away from violent extremism before it occurs. Community-based input into these interventions is crucial given how local context can both promote and protect individuals from radicalization to violence. Furthering Our Communities by Uniting Services (FOCUS) Toronto is led by the Toronto Police Service, City of Toronto, and United Way Toronto and York Region, and partners with local agencies to assess the needs of individuals experiencing acute health or social problems that require a multi-disciplinary intervention. FOCUS is building capacity to add radicalization to violence to the range of issues addressed. Ottawa Multiagency Early Risk Intervention Tables (MERIT) is a collaborative intervention program supported by the Ottawa Police Service, local agencies, and service partners that aims to reduce crime and victimization and to improve community resilience and well-being. Merit is building capacity to address cases of individuals radicalizing to violence. Edmonton Resiliency Project is a collaborative approach to prevention and intervention that draws on trusted community and organizational relationships to prevent violent extremism. Engagement, education, and online and offline intervention are delivered by the Edmonton Police Service, City of Edmonton, and Organization for the Prevention of Violence. Calgary Re-Direct is a partnership between the City of Calgary, Community and Neighbourhood Services, the Calgary Police Service, and other professional partners that uses a multidisciplinary approach to intervention with youth and young adults who are vulnerable to radicalization to violence. The Organization for the Prevention of Violence:The Canada Centre is providing support through the Community Resilience Fund to the Organization for the Prevention of Violenceto bring together subject matter experts, front-line practitioners, and community activists to assess potential sources of violent extremism in Alberta. The funding will also be used to design educational materials and intervention procedures that will be provided to practitioners, community members and other stakeholders to guide their work in countering radicalization to violence. An important priority for the Canada Centre is supporting training for front-line workers and practitioners so they can assess cases of radicalization to violence and intervene effectively. Individuals at earlier stages of radicalization, as well as those acutely at risk will often have interactions with front-line workers and practitioners (e.g. nurses, school counsellors, psychologists, social workers, youth workers, parole and probation officers) at some point along their pathway to violence. It is important that those workers and practitioners are equipped to recognize risks and intervene. A priority for the Government of Canada is to develop, refine and mobilize resources that can help inform and improve assessments and interventions. This includes supporting the development of training and information resources, as well as working with professional organizations and associations to create standards and best practices for working with vulnerable individuals. Canadian Practitioners Network for Prevention of Radicalization and Extremist Violence (CPN-PREV) is a network established to bring forward Canadian leadership and develop excellence in countering violent radicalization by supporting evidence-based best practices and collaboration among practitioners, researchers and policymakers. Training materials produced from this project will support a growing community of professional practitioners in Canada involved in assessing, preventing, and intervening with individuals who are at risk of radicalizing to violence. Some Canadians have travelled abroad to participate in terrorist activities. Some travelled to Iraq, Syria and Turkey, while others went to Afghanistan, Pakistan, parts of north and east Africa and elsewhere. Some have acquired spouses and children. Of particular concern is the prospect that some who have travelled abroad may return to Canada to conduct attacks, facilitate or inspire others to do so, or further other threat-related activities. Investigating, arresting, charging and prosecuting any Canadian involved in terrorism or violent extremism is the Government's main strategy and priority. In addition, other options are pursued, including: surveillance, interviews and further investigations; intelligence gathering and lawful sharing; on-going threat assessments; no-fly listings; the refusal and revocation of passports; legally authorized threat reduction measures; and terrorism peace bonds. Alongside these national security measures, the Canada Centre funds intervention programming and capacity building for front-line workers and practitioners who may be called upon to support the disengagement of extremist travellers, and their families, from violent extremist ideologies. These interventions do not replace, prevent, or exclude monitoring and investigating by security agencies. The National Strategy on Countering Radicalization to Violence is intended to be a flexible framework to guide prevention-based initiatives towards countering radicalization to violence. In particular, the strategy is adaptable to an environment where the threat of violent extremism is constantly changing, as well as the means through which the threat is expressed. The strategy also aims to raise awareness of what is currently known about radicalization to violence, so practitioners, front-line workers and Canadians in general are better positioned to help prevent it. Being equipped with the latest information and tools is crucial to implementing effective prevention efforts. Finally, this strategy is a tool for continuous dialogue with Canadians and aims to stimulate discussion on this challenging topic. The strategy promotes the kinds of collaborations between the Government of Canada, its partners, and Canadians that are fundamental to ensuring that efforts to counter radicalization to violence in our country are responsive to local realities. By continuing to build those connections, together we will increase our collective capacity tokeep our communities safe.